I found an interesting whitepaper „Securing the Enterprise with Intel AES-NI“ from Intel. This white paper explains how the new AES-NI instructions in Intel Xeon 5600 series can improve the AES encryption/decryption. When I read the first time about this feature I was impressed. OpenSSL (AES part) is up to 7 times faster with this new instruction set. Intel did also some tests with Oracle 11g and Transparent Data Encryption (TDE) in AES-256 CBC mode. The usage of the optimized Intel Integrated Performance Primitives (IPP) shows an 89 percent reduction (3.33 GHz Xeon X5680 vs 2.8 Intel Xeon X5560) against a previous processor. This is a huge advantage and if you use TDE you should think about using such a new processor. Today I want to present the Netsparker Community Edition. 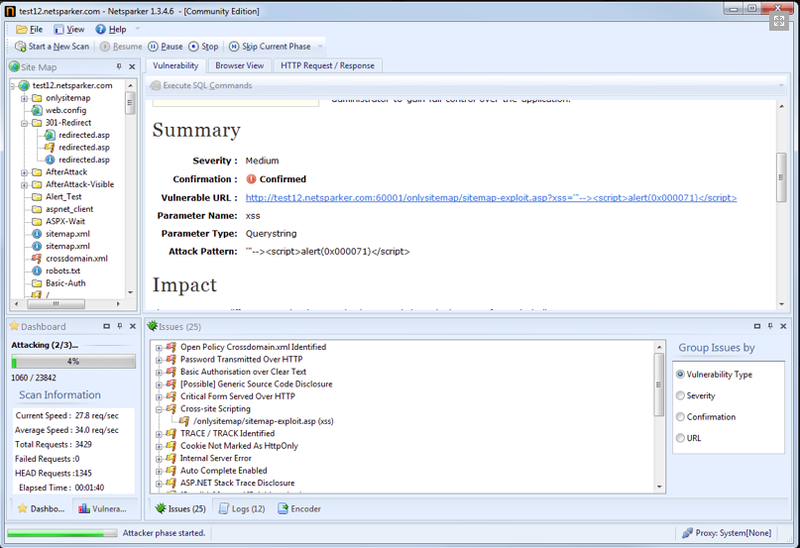 Netsparker (from Mavituna Security) is the best web application scanner I know. Easy to use and a really good web application scanning results. It saved me a lot of time and helped me to find security bugs in Oracle applications (Enterprise Manager). The best thing: The new community edition is free (OK, with some limitations). The commercial versions have even more interesting features like Time Based Blind SQL Injection, Remote Code Injection, OS Level Command Injection , CRLF / HTTP Header Injection / Response Splitting, …. The entire feature (and price) list is available here. If you are interested just download the community edition. Joxean Koreat has released his presentation „Hackproofing Oracle Financials 11i / R12“ from RootedCON 2010. Joxean shows some nice ways to own old and new Oracle Financials installations. Thanks to Sid for the link via twitter. You are currently browsing the Alexander Kornbrust Oracle Security Blog blog archives for April, 2010.